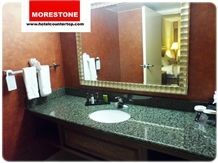 Granite or quartz vanity top has become the popular selection for hoteliers in United States and Canada. 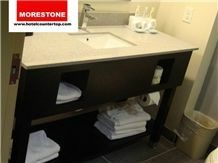 It was once only used for exclusive hotel, and now it becomes a standard hotel vanity configuration in the lodging industry, and widely used by hotelier, architects, designer, developer and contractors. It is designed and produced to be installed between two walls for support purpose. 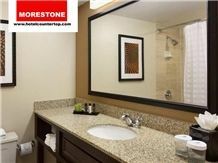 The granite or quartz vanity top is typically 22inch deep with undermount oval/rectangular sink attached. 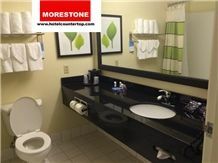 The location of the porcelain sink could be placed on the left, right or center of the vanity tops. Sometimes it may include a 8" height apron running below the length of the vanity top. Tissue holer slot or/and toilet paper holder cutout may be required if necessary. 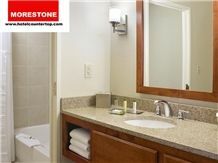 2) Typical side support vanity top for ADA restricted bathroom or hotel vanities which are not supported by a side wall. 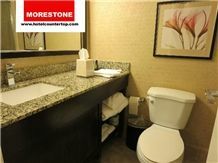 Granite or quartz tops are cut to create a support leg to stablize the vanity top. Its apron is usually 4" height a allow for wheelchair accessibility. 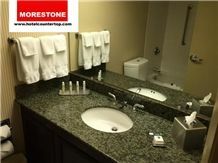 Morestone Granite & Marble Limited, locating in Xiamen China, is an integrated producer and supplier of natural stone and engineered quartz stone countertop & vanitytop, furniture & fixtures, floor and wall tiles, tub and shower surround panels for hospitality and multifamily industry. Welcome to send inquiry for estimate or order purpose. 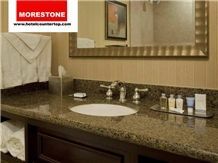 I am looking for Granite Santa Cecelia Bathroom Countertop for Embassy Suites Hotel.